The new Fulcrum revealed and much more! 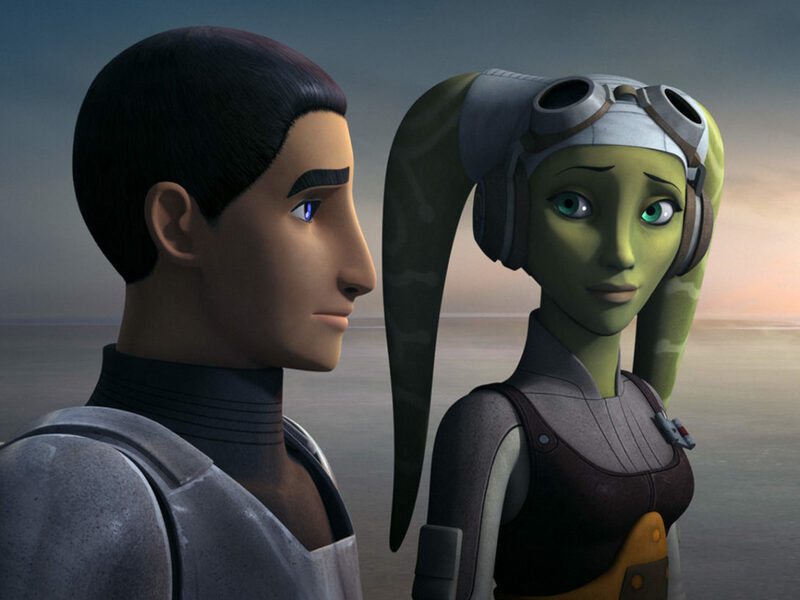 In “An Inside Man,” Kanan and Ezra go undercover at an Imperial facility on Lothal and discover there’s a lot more going on than anyone expected — and get some help from an unexpected ally. Here are my 10 favorite moments from the episode! 1. 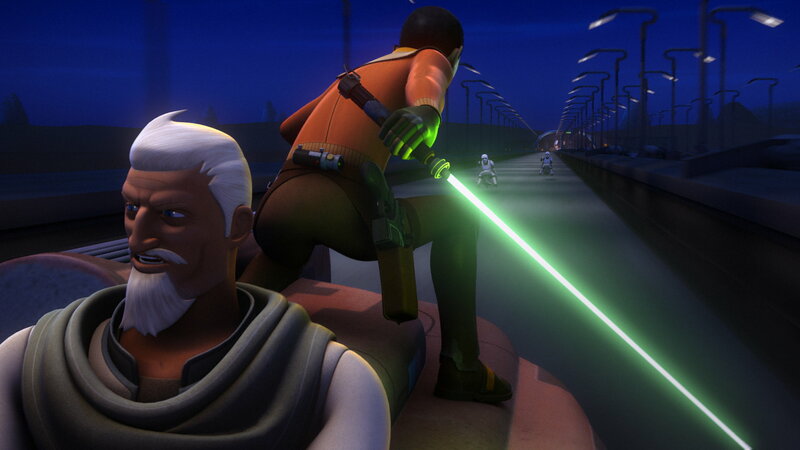 It’s been awhile since we had a speeder chase through the streets of Lothal. And what a chase. Between the speeder flipping all over the place and Kanan and Ezra shifting position to fight the Empire, there was a lot going on. 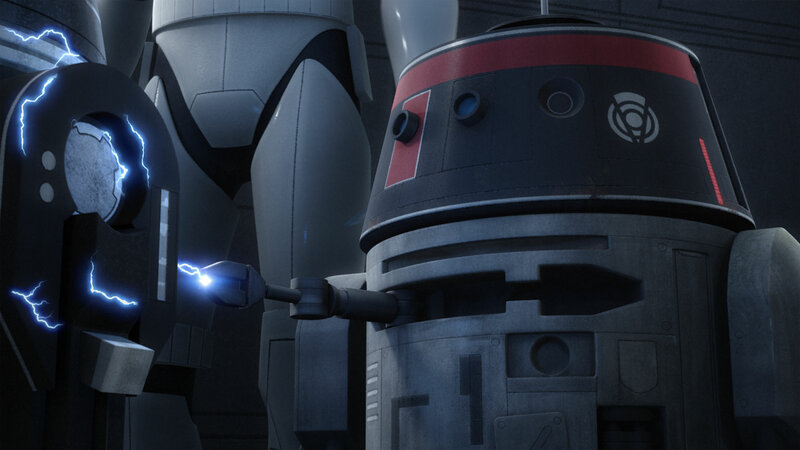 Not to mention the sideways Jedi lightsaber double swipe to the AT-DP’s legs…definitely, a great way to start the episode. 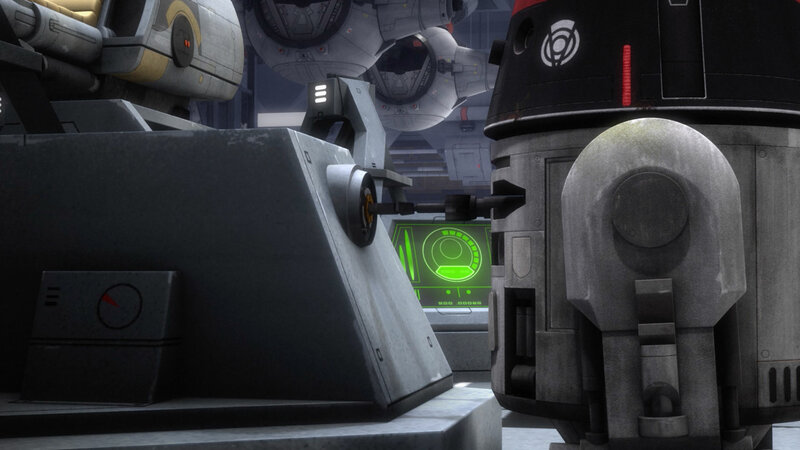 It was nice to see the resistance fight back against the Empire with their own equipment and also learn more about the infiltration of the factory. 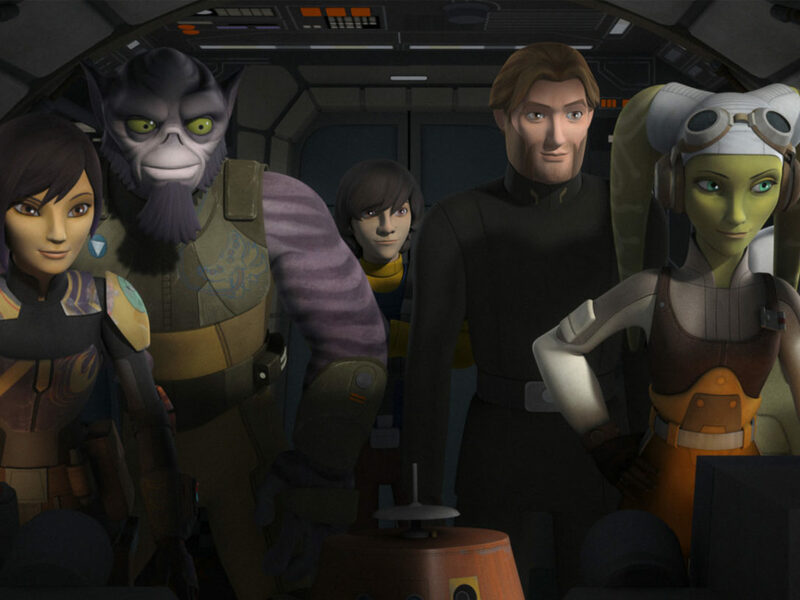 The big takeaway for me was the revelation that Phoenix Squadron is planning an upcoming attack on Lothal in partnership with another rebel cell. Iron Squadron? Bail Organa? What’s your guess? 3. Thrawn is a really, really bad dude. Just when you forget how dangerous Thrawn can be, he sets up a demonstration to remind you. 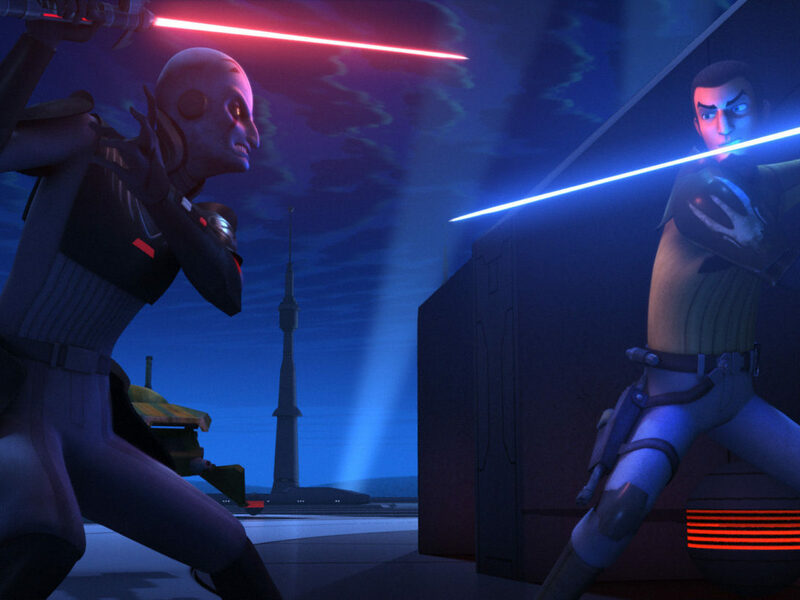 You may think you can get something past him, especially given how often the rebels were able to thwart other Imperial officers on Lothal and Garel, but Thrawn is a new challenge and forgetting that can be deadly. 4. Chopper’s really good at distractions. 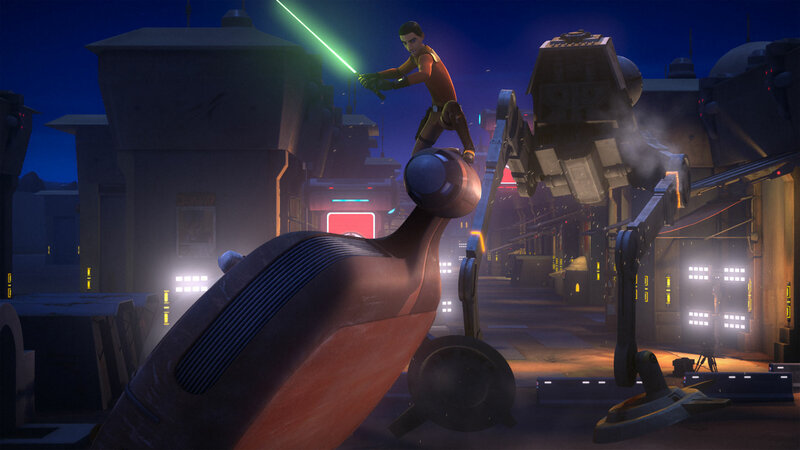 Kanan and Ezra are trapped inside the factory and comms are down, so Chopper sends a speeder bike flying into the wall because of course he does. 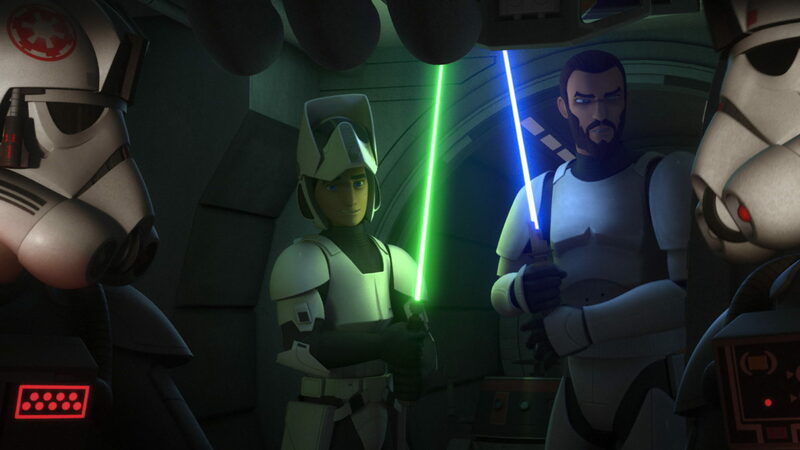 I also enjoyed the timing between Kanan and Ezra’s realization that they need disguises and the appearance of two troopers. Ka-pow! Situation solved. 5. I love it when a plan comes together. 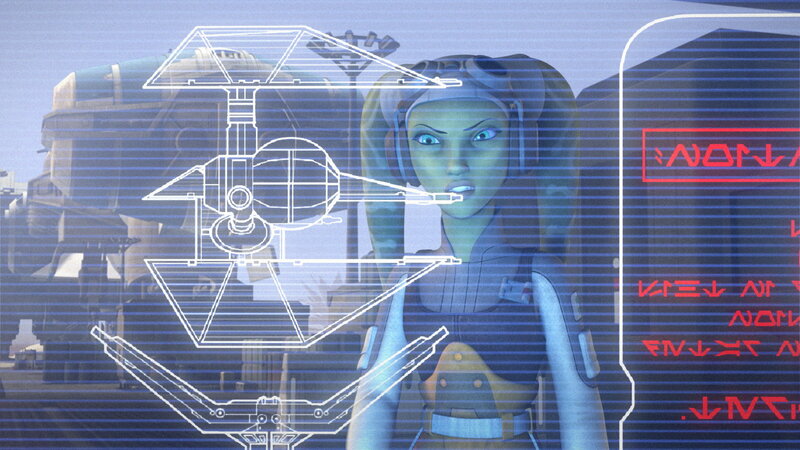 The whole scene with Kanan, Ezra, and Chopper working together to get the ID card from the Imperial droid was priceless. It would be so great to see an episode with just the three of them working together, Mission Impossible-style. 6. 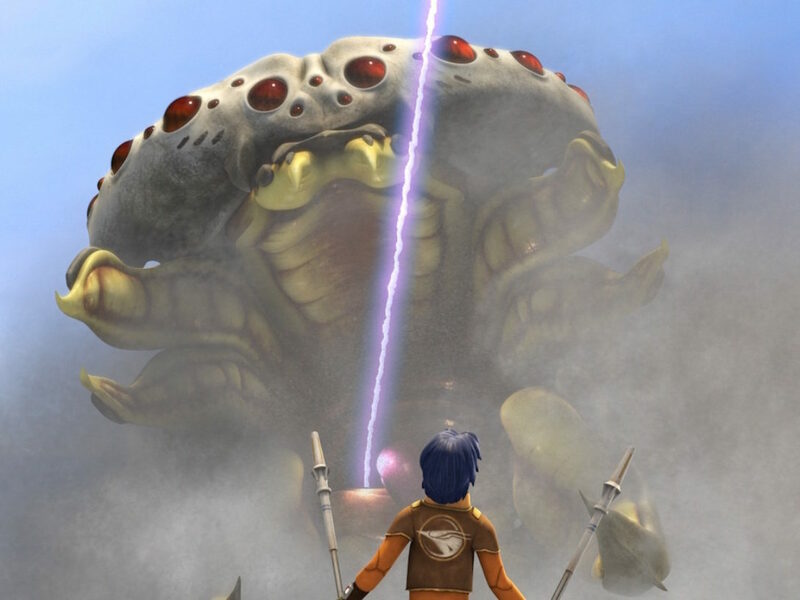 Thrawn is getting a clearer picture of his enemy. The depth of Thrawn’s analytical genius has yet to show its limits and he’s already figured out so much. 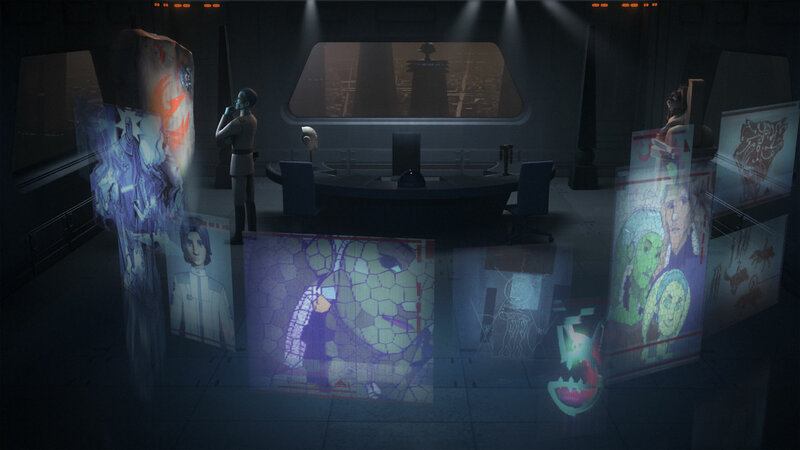 From the malfunctions in the factory to Sabine’s Phoenix graffiti, Thrawn sees a larger pattern. 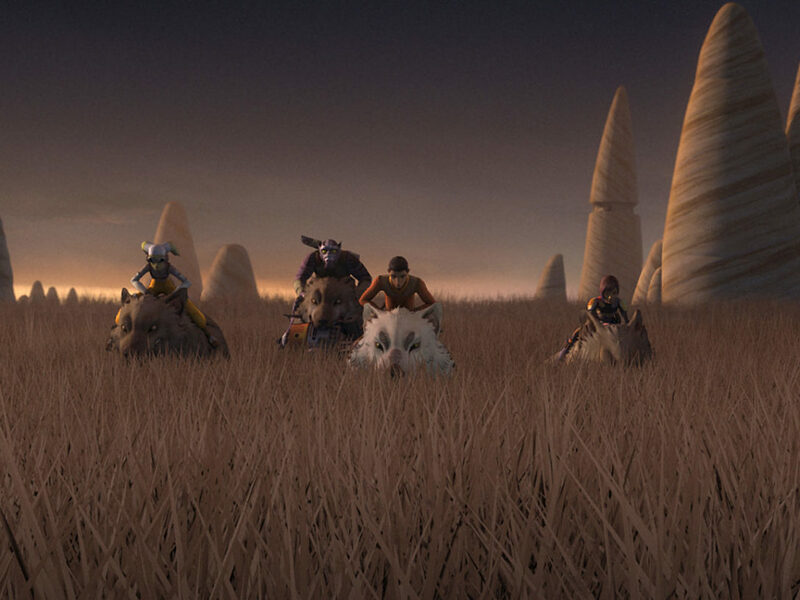 He knows the rebels care about Lothal. Knows they’re headed for section A2. He’s figuring them out and that’s bad news for our heroes. He knows the code phrase. He’s helped them before. He sure sounds like he might be Fulcrum. 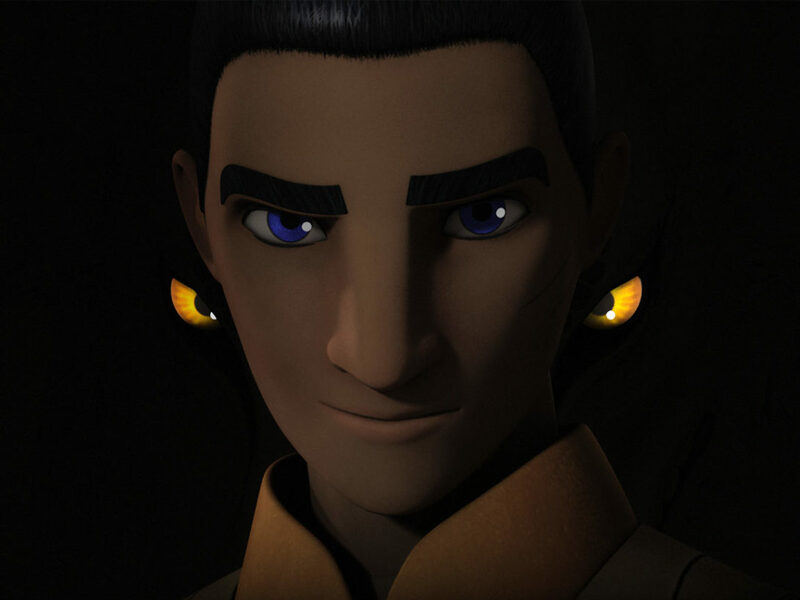 But it’s hard to trust a guy who’s tried to kill you multiple times, so it makes sense that both Kanan and Ezra are skeptical. 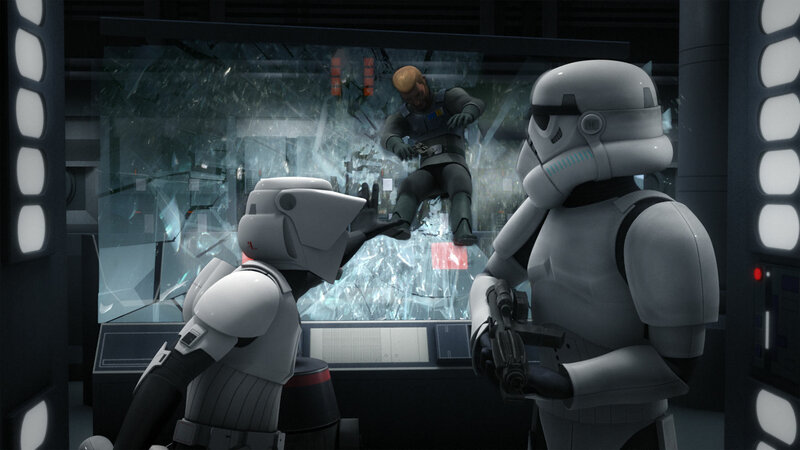 I particularly enjoyed Ezra Force-pushing Kallus through the glass — and Kanan’s only objection being that Ezra was the one who did it. 8. The dance of the walkers. Rebels has done some really interesting things with walkers but I think this is the most intricate yet. Between the AT-DP hiding behind one of the AT-ATs, as the other one tries to get a shot, to the first driver deciding just to sit the walker down and crush them, that’s some awesomely creative choreography. Ezra and Kanan’s appearance at the end was a cherry on the sundae. 9. A new TIE model fighter. 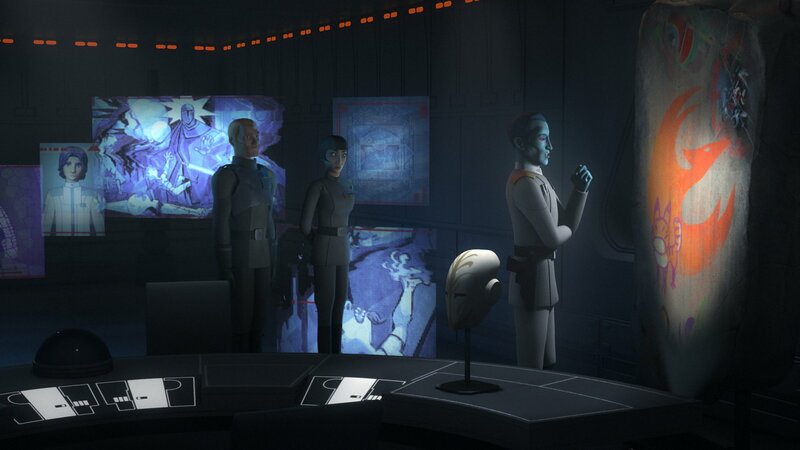 The revelation that Thrawn has working plans for a new TIE with shield capability is a shock and certainly lays groundwork for a battle to come. We haven’t seen this ship before, so will we get to watch in action it before the end of Season Three? Beyond that, the revelation that Kallus is Fulcrum will take some time to suss out. I’ll be interested in that going forward. 10. A spy in the ranks. Once again, Thrawn’s analytical prowess has resulted in a realization that we know to be 100% true. 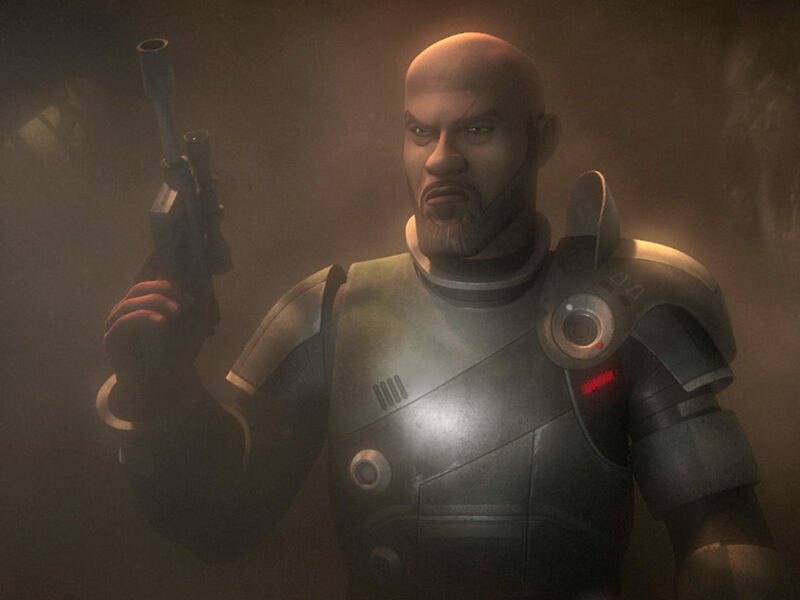 He’s not only figured out that someone’s helping the rebels, but even claims to have an idea of who it might be. 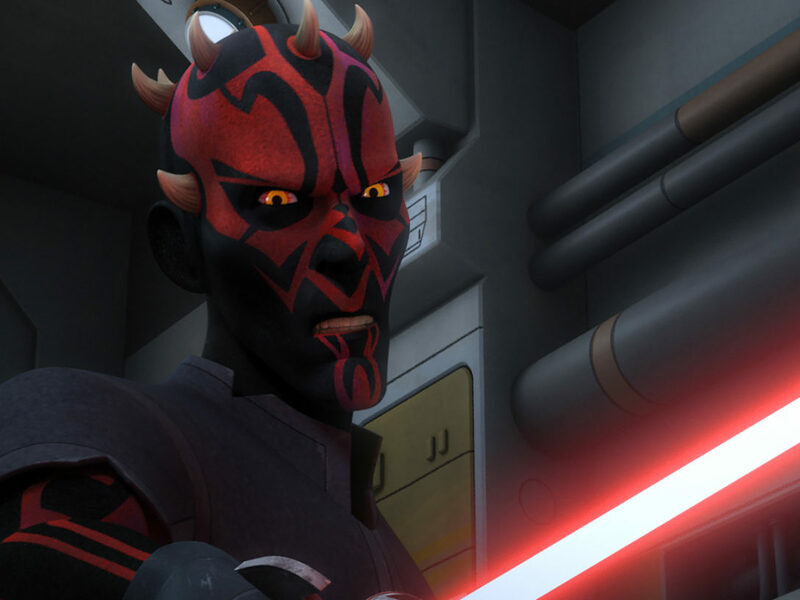 Let’s hope Kallus finds a way to throw him off the trail before it’s too late. 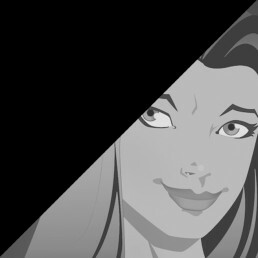 Kanan and Ezra’s “Are we in section B-17?” caused me to do a little research on Google and, wouldn’t you know, there’s a special connection to that very number.